The Auerbach Center, the Celtics’ new practice facility, pays homage to the past with modern flair. 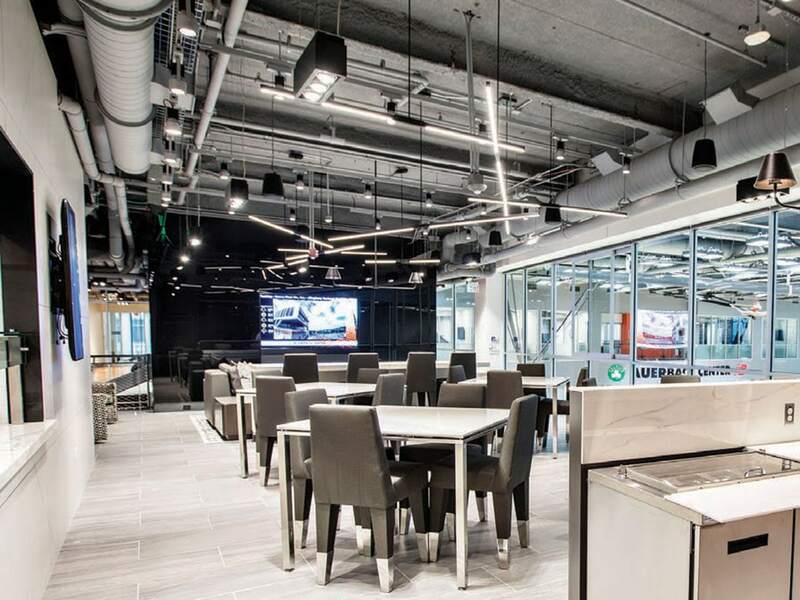 The Celtics’ Brighton headquarters gleams with custom elements and sophisticated appeal. Designed by architecture rm Elkus Manfredi Architects (elkusmanfredi. com), the 77,000-square-foot facility—more than double the size of the team’s former home in Waltham—includes two full-size practice courts, state-of-the-art medical exam equipment, a media center, nap room, swimming pool and much more. While the functionality of the space was key, the aesthetic was also important, says Jay Wessland, the Celtics’ vice president of operations. “We didn’t want a big white box. We need a showplace to attract quality players and show sponsors that we are a top organization. e goal was to marry a new modern vibe with some of the old Celtics traditions.” When construction of the building was underway, Celtics owner Wyc Grousbeck brought designer Lucinda Loya (lucindaloyainteriors. com) on board to set the interior scheme. “The facility needs to serve a lot of purposes: It’s a place for players to recover, to bond with one another and to dine together,” says Loya. “It had to feel comfortable, cuttingedge and stylish enough to be attractive to the players.” Emphasis was largely put on having furniture custom designed to suit the players’ heights; warm colors and replaces evoke a relaxed vibe. To encourage team spirit, rugs have slogans—for example, “Do what you do best”— artfully woven into them. While furnishings and xtures are decidedly modern, nods to the past abound. An iconic wall mural, for example, shows the building namesake, Red Auerbach, courtside, pung away on his ever-present cigar.